See you all in 2019 in New Ulm, Minnesota! Welcome to the National Call Breeders of America! 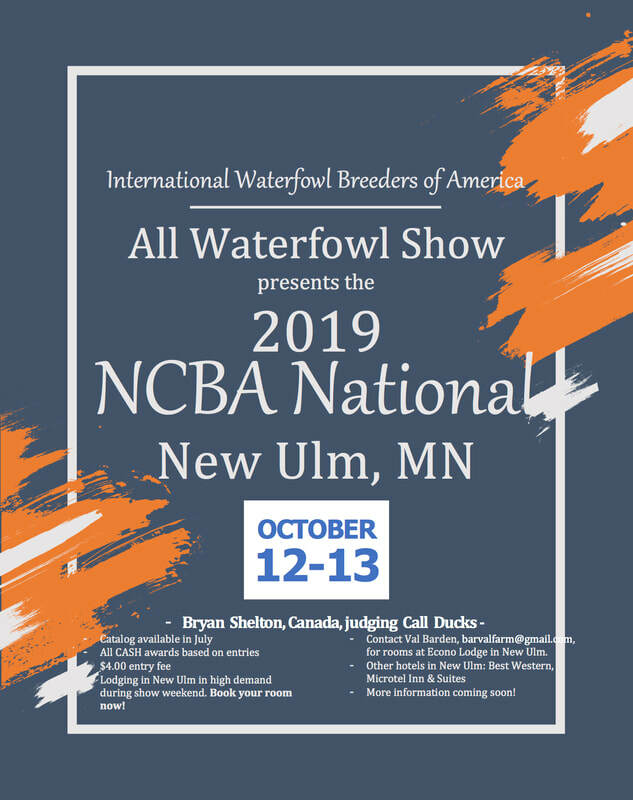 Welcome to the National Call Breeders of America Website! The National Call Breeders of America was founded in 1986 by Ed Cline of Dalton, GA. The club was formed to encourage the breeding and exhibition of Call Ducks by offering club awards and a Master Breeder program. Prior to the creation of the club, there were very few Calls shown in the South and other areas of the country and Calls received little attention in shows even where a few were shown. The popularity of this colorful, intriguing, and quite enjoyable breed of waterfowl has skyrocketed in recent years. Due to it’s smallness in size, the breed is much easier to maintain and handle for those with less space. Their charming personality and demeanor make this breed a sheer joy to raise! In the 2002 American Bantam Association yearbook, Call ducks were fifth in popularity, following closely behind Wyandottes, Cochins and Plymouth Rocks. Each District in the U.S. has a District Director, those are listed on this site as well. You are encouraged to contact those Directors with any questions about the club, shows in the district, and breeders within their district that might have birds available for sale. Each District hosts a District Meet each year and a number of Special Meets happen all over the U.S. The club hosts a National Show every year that is held at a location chosen by our Board of Directors. This is an incredible experience for breeders and those interested in call ducks… hundreds and hundreds of the finest call ducks assembled under one roof! We welcome you to our website and invite you to continue coming back often as we will be making additions to the site. We encourage you all to purchase a membership, whether a Standard Membership or a Junior Membership, and begin to share with us in the delight of raising and exhibiting this incredible little creature! Feel free to contact me or any of the Officers or District Directors of the club for more information at any time.